Glucose Rapid Spray was one of my finds at the American Association of Diabetes Educators’ (AADE) Conference a few weeks ago as I ambled through the Exhibition Hall. I think it’s a most innovative product that offers three distinct advantages–it provides what it says “rapid glucose delivery” with quick absorption through the surface of your inner cheeks. It offers great portability as its tiny size fits in the palm of your hand, and, it can delay and possibly deflect a low. My only word of caution, however, since we all react to things diabetes differently, is if you give it a try, since it’s uncertain just how many sprays will lift your blood sugar how far, test your blood sugar response over an hour after using, to see how your body reacts. The directions call for 5-10 sprays but you may require more, or less. Also, it’s not marketed as an emergency remedy but a way to keep your blood sugar from dropping like a stone before you can treat it. My unexpected test of Glucose Rapid Spray occurred the other day when I took my usual one hour walk around my local park and returned at 11 AM with a blood sugar of 50. Great, I said, now I can try out Glucose Rapid Spray! 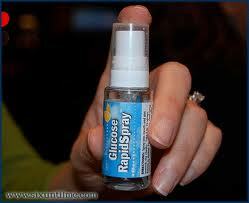 The label directs you to spray 5 to 10 sprays into your mouth directed to your cheek and repeat as desired. So I sprayed 5 sprays into each cheek. While I have the orange flavored version, it also comes in raspberry, the taste is strong, and almost simultaneously sweet and slightly bitter. I checked my blood sugar fifteen minutes later and it had lifted me to 60. Not bad I thought, but wanting to see what would happen over a bit more time I tested my blood sugar again in another fifteen minutes, now 30 minutes from my initial blood sugar of 50. I was 53. I had risen to 60 and then dropped to 53. Obviously I needed more than 10 sprays to lift me higher. As the directions instruct, I could have sprayed several more mists, but I opted since I was already home to chomp on some glucose tabs. The takeaway: this may indeed be a valuable product to have with you when you’re on the go to delay a major low, but I’d suggest testing it to determine how many sprays you require to lift your blood sugar sufficiently before you can get your hands on some fast-acting carb or your next meal. As promised, here’s my brief report of the 35th annual conference of theAmerican Association of Diabetes Educators (AADE). 4,000 educators from around the U.S. and a sprinkling from outside the U.S. convened at the Convention Center in Washington D.C. for four days of lectures to earn credits and learn the latest news regarding drugs, devices and behavioral practices to better help their patients. They are an impassioned group truly wanting to make a difference. Having a concern of my own, why I’m getting red dots every time I inject, each educator I asked went right to work examining the problem and investigating my behavior truly wanting to help, and yes, I did take advantage of my circumstances. Unfortunately, diabetes educators are dwindling in number each year while patients are increasing, making their work ever-more demanding. My husband and I descended upon Washington together both eager to hear what educators are learning, teaching, what’s new in the field and how patients are being served and responding. I also wanted to thank, in person, the many experts who were speaking there and have been helping me with the book I’m currently writing, debunking diabetes myths. Arriving the night before the conference began our first self-assigned task was to find fruit for the husband’s next morning breakfast. Within a 20 block radius of downtown D.C. there is not a banana, orange or apple to be had. Trust me, I know; I asked shopkeepers, restauranteurs, passers-by and the hotel concierge. The closest we came was Tang, a powdered orange juice like drink at a CVS drugstore, but alas, not a single piece of fruit. I found it remarkable that blocks away 4,000 people had convened to learn how to help patients improve their diet and eating habits, and yet in our nation’s capital I could not find a piece of fruit. Proving once again diabetes is not just a medical issue, not just a behavioral issue, but also a systemic issue: our society’s infrastructure does not support practicing the healthy behaviors we hear about daily on the morning news. But, forgive me, I digress. The conference was opened by Amparo Gonzalez, current president of the AADE. Her lilting accent welcomed everyone in the huge basement hall where I sat amid a sea of largely Caucasian, middle-aged women, with perhaps one man to every 50 women. Elizabeth Edwards, the key-note speaker, gave an hour long, impassioned address sharing her own experience of living with cancer and built a bridge between all of us who live with a chronic illness. She was real, warm, bright, funny, engaging, shared her darker days with cancer and spent the last 15 minutes comparing Senators McCain and Obama’s health plans. While she promised to be impartial, which I believe she was, she gave both plans low grades letting us know neither is as workable as either politician would have us believe. I left concerned that our already broken health care system is not getting fixed anytime soon. Unfortunately, two days later her broken marriage was being aired on the Convention Center’s TV monitors every few feet. New medicines, largely that deal with type 2 diabetes, and more meds on the horizon indicate diabetes is not merely an insulin problem, gastric hormones are getting more and more attention. The artificial pancreas is inching ever forward in trials largely due to the efforts of the Juvenile Diabetes Research Foundation. Diabetes educators’ largest hurdle is getting patients to change behaviors: adopt healthier eating habits and exercise. Educators’ second biggest hurdle is once they’ve gotten patients to adopt healthier behaviors, getting them to sustain them. The drop off seems to occur 4-6 weeks later. Educators are being encouraged to shift from being “teachers” instructing patients to being “coaches” partnering with patients. “Peers for Progress” is a new AADE initiative getting underway to utilize patient mentors. We knew it was coming, too many patients for too few educators. Personal note: My book, The ABCs Of Loving Yourself With Diabetes, initially declined by the AADE bookstore because it wasn’t deemed something educators would find useful, sold out in the first few days. Most educators I spoke with find trying to change patients’ behavior difficult and challenging, yet derive enormous fulfillment when they can help a patient succeed. As one told me, “If I can really make a difference for just 10% of my patients, I’m so happy.” I think they are soldiers, every one of them always on active duty. In truth, I’m surprised there isn’t a higher burn-out rate amongst educators. In my next post I’ll tell you what I found new and interesting at the Exhibition Hall where another 1,000 people had gathered to show their wares. Want to lose weight and get healthy? Nutrient-dense foods. Are you ready to Eat to Live? Maybe he’s just another hawker wanting to sell books or sit next to Oprah, or maybe he’s got it right. Joel Furhman is a doctor and up and coming weight loss healthy eating guru. I’m now reading one of his earlier books, Eat to Live, from 2003 and here’s his proposition in a nutshell: Make the overwhelming bulk of your diet nutrient-dense foods and you’ll avoid disease, particularly heart disease and cancer, your diabetes’ symptoms may go away if you’re type 2, your blood pressure and cholesterol will lower and you’ll lose weight and maintain a “normal” body weight. Furhman says most of our weight, ills and diseases come from our (profit-making-big-business) unhealthy American diet which is high in fat, refined carbohydrates and calories and low in nutrient-dense foods, leaving us hungry, unsatisfied, fat and unhealthy. Further, our most recent mania to control portions is like putting a band-aid on a levy that’s bursting; limiting our portions of non-nutritive food may cut some calories but it still leaves us nutritionally deficient with over stimulated appetites. He says if you have type 2 diabetes you can eradicate insulin resistance using his eating plan, if you have type 1 you can dramatically lower your insulin requirement. And I believe him. It seems common sense to me that the over-processed, packaged, chemically-formulated and steroid-pumped, refined junk we eat causes weight gain and disease. 1. Olive oil is not the miracle drug we all thought, 97% of its fat will go straight to your hips so use it limitedly. 2. Leafy greens like salad greens and green vegetables are 1/2 protein, 1/4 carbs and 1/4 fat. Who knew? You don’t need to eat a side of beef to get enough protein if you’re eating lots of veggies. 3. If you’re eating a diet rich in fresh fruits and veggies you’re getting enough water. 8 glasses a day, fugedabout it, 3 is plenty! 4. Furhman agrees, don’t be fooled be foods that say “fortefied.” A spray of folic acid won’t do it. 5. Animal protein whether white, as in chicken or red, as in beef is equally disease causing. Fish is better but even fish should only be eaten 2xweek and mercury-free. 6. Don’t worry about getting the right mix of veggies and beans etc. on your plate to get your protein covered, eat this healthy way and you will. Mind you, always, any significant change in your eating plan may create a change in your blood sugars, which means a change in your medication–and I guarantee you if you follow this plan you will definitely need less medicine, whether you’re on orals or insulin. So, be alert and discuss this with your health care provider. If you have a condition like kidney disease you may not be able to eat enough veggies, fruits, nuts and legumes for this to work for you, so please don’t undertake this without consulting with a professional. Also if you have vitamin or mineral deficiencies talk with a professional before making any dietary changes. You might call this a super-charged slightly left of center vegetarian eating plan, but many vegetarians rely on refined carbs and saturated fats like pasta, crackers, pretzels and cheese, which are not nutrient-dense, whereas this plan is mostly vegetables, fruits and beans. Whole grains, healthy fats and animal protein are parceled out according to your weight loss goals. Of course, restaurants and social outings are harder to maneuver than home cooking, so he proposes using outings as a time when you indulge a little. If you’re living in this century, time is the other nasty. Who has much time to shop and prepare vegetarian meals? Furhman offers recipes, but darn, somebody’s got to make them. I mostly do the simplest thing: steam an assortment of fresh veggies every night for dinner, lunch is a spinach salad with beans, left over veggies from the night before and a little feta cheese. Breakfast is steel cut oats. If you want to really get healthier and drop some pounds read the book, try the diet and see what you think. Wouldn’t it be remarkable to shed those 20 pounds forever, really feel full and satisfied, and watch your health transform, including your energy and outlook? End note: I will be away this week at the American Association of Diabetes Educators annual conference in Washington D.C. I am not an educator or any other type of medical professional, merely a lay person interested in knowing what educators are learning, talking about, being taught, where their struggles are with patients, what they see for the future and will let you know.